Canadian families with two or more people had an estimated median income after taxes of $54,100 [in 2004], up about 2% from 2003 in real terms after adjusting for inflation. Statistics Canada's low-income rate measures the percentage of families below the low-income cutoff (LICO). The LICO is a statistical measure of the income thresholds below which Canadians likely devote a larger share of income than average to the necessities of food, shelter and clothing. In 2004, about 3.5 million people were in low income. They accounted for 11.2% of all Canadians in 2004, well below the peak of 15.7% in 1996. Among families, the proportion living in low income after taxes declined to 7.8% in 2004 from 8.5% the year before and a high of 12.1% in 1996. The news is not uniformly good: not all groups saw a significant improvement in their situation in 2004. But it does seem part of an encouraging trend in real incomes. One of the main predictions of standard neoclassical growth models is convergence. If there are diminishing returns to capital, countries that have relatively higher levels of capital will have lower rates of return on investment than will countries in which capital is relatively scarce. Since poor countries offer higher rates of return on investment, they will accumulate capital at a faster rate - and will eventually catch up to rich-country levels of income. If convergence was occurring between 1950 and 2001, the relationship between initial income and average growth rates should be negative: countries that were relatively poorer in 1950 should have had higher growth rates, so that they might catch up to richer countries. But the estimated relationship above is essentially zero. Upon closer examination, things start to look a little odd. I've plotted an handful of countries whose importance - demographic, economic or (in the case of Canada) purely subjective - seemed to merit a second look. If you look at just those countries, the estimate seems somewhat surprising - a casual glance suggested that the negative relationship is in fact there. This isn't new; others have found the same thing. But I thought it would be interesting to look at how this relationship has evolved over time (John Maheu and I have a project on structural breaks, so this is a question I ask myself fairly frequently these days). So here are the population-weighted results for the sub-periods of 1820-1870, 1870-1913, 1913-1950, 1950-1975 and 1976-2001. I've kept the same scale for each graph. In the early 19th century, the story was clearly not one of convergence: countries that had industrialised first had higher incomes than those that hadn't, and they extended their lead. In the latter part of the century, the dominant trend is still the distinction between high-growth industrialised countries and the rest of the world. But within that group, the convergence story begins to apply: the US and Germany start to catch up with the UK over this period, and countries such as Canada and Argentina benefited from capital flows from richer countries. 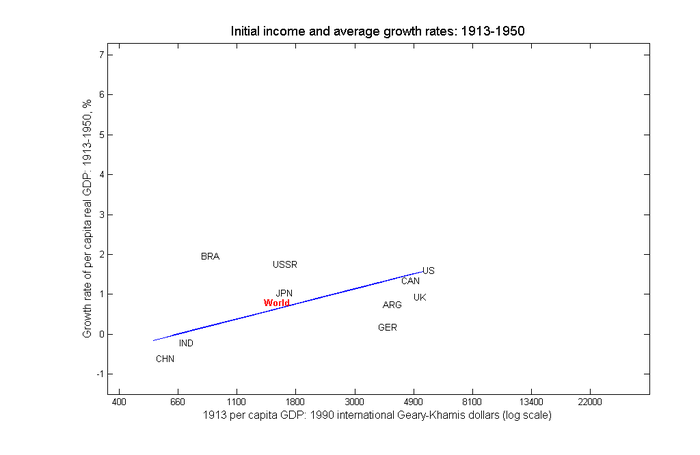 Note also that since high-income countries had been growing faster, the dispersion of incomes in 1870 is greater than it had been in 1820. By 1913, the US had caught up to the UK, and since geography set it (and Canada) from the worst of the effects of the two world wars, it emerged as the leading economic power. This graph more or less corresponds to the Bretton Woods era. Although this period had the highest rates of growth in history, this growth was mainly concentrated in countries that were already relatively rich in 1950. If there's a convergence story to be told, it's in the performance of Japan and Germany - countries that had lost ground against the US during the first part of the century. It is only in the last 25 years or so where we finally see convergence. The most important data point is of course China, but even if China is excluded from the sample, the relationship between initial incomes and average growth rates is still negative. There are lots of conclusions that could be drawn from this exercise, but I think the most important one concerns international capital mobility. Whenever capital is free to move from rich to poor countries, poor countries catch up. There are two list prices of my copy of Freakonomics: $C 34.95 and $US 25.95. Yesterday's closing CAD-USD exchange rate was 0.8642. This means that that if you had $C 30,000 handy, you could exchange that for $US 26,000, drive across the border, buy 1000 copies of Freakonomics, cross back again and sell them for $C 35,000, for a tidy profit of $C 5,000. A 17% rate of return on a cross-border round trip sounds like an awfully good deal, and one of the mysteries facing economists is why so many people ignore that bundle of cash on the sidewalk. Yesterday, the Ontario government announced that it would lift the freeze on tuition fees that it had imposed two years ago, and that it would expand its program of aid for students from low-income households. Student debt is an important issue, but it doesn't affect all students: only about half of those who graduate with bachelor's degree do so with debt. Since it's not a problem that affects everyone equally, it doesn't make sense to use a one-size-fits-all policy to address it. For a student who comes from a high-income family, a moderate increase in tuition fees has essentially no effect: she will still go to university. For students from the upper end of the income distribution - a group that faces relatively fewer obstacles to higher education - a reduction in tuition fees amounts to a gift to people who were going to go to university anyway. Far better to take the increased revenues generated by higher fees and target them at students from lower-income households. I may have to rethink my opinion on the Toronto Star's understanding of economics: in today's lead editorial, they too applaud the decision, and for the right reasons. Sadly, Murray Campbell over at the Globe and Mail seems to miss the point. The overnight rate was increased 25 basis points to 3.75%. Information on the Canadian and global economies received since the January Monetary Policy Report Update has been broadly in line with the Bank's expectations, although the Canadian dollar has recently moved above the range that had been assumed in the Update. Real gross domestic product increased at an annual rate of 2.5 per cent in the fourth quarter of 2005, as the Bank had projected, and both CPI and core inflation have also come in as expected. Overall, indications are that the Canadian economy is continuing to operate at its full production capacity. Recent data do not alter the Bank's outlook for growth and inflation, including its assessment of risks, as set out in the January Update. Consistent with this view, some modest further increase in the policy interest rate may be required to keep aggregate supply and demand in balance and inflation on target over the medium term. The Bank of Canada has increased its target for the overnight rate by 25 basis points four times in a row, from 2.50% to 3.50%, and if its January monetary policy report is anything to go by, it seems intent on continuing this trend. Output continues to hover around the Bank's estimate of capacity, and even though the overnight target is 100 basis points higher than it was last summer, that increase is from a very low base. It's unlikely that the Bank feels that its objective of withdrawing stimulus has been attained yet. But it won't be long before increasing interest rates will be actually contractionary, and since the medium-term outlook doesn't look good, the Bank will have some tricky judgment calls to make over the next few months. As far as I can tell, the attitude of policy-minded intellectuals to economics is pretty much unique. Many people have opinions about legal matters or about defense policy; but they generally accept that a fair amount of specialized knowledge is necessary to discuss these matters intelligently. Thus a law degree is expected of a commentator on legal affairs, a professional military career or a record of study of military matters is expected of a commentator on defense, and so on. [W]hy is this attitude so prevalent? At this point, I am in the awkward position of having to defend economic professionalism by playing amateur sociologist, but let me offer the following five-part hypothesis. First, economics is a subject that touches so many real-world concerns that there is a great incentive to claim expertise. This is especially true of international economics, in which the romance and allure of anything to which to word “global” is attached adds to the attraction of the enterprise. As a result, a large number of people inevitably propound views about international economics without much background in the subject. Second, ignorance finds strength in numbers. Since so many lawyers, political experts, etc. feel free to opine on economics, others considering such a role do not hesitate over their lack of formal qualifications or knowledge of the field. Fourth, there is a lot of bad-mouthing of economists. This is understandable. After all, suppose you are, say, a military expert who has decided that he is an economic expert too. You write an article or even a book on the subject; then an academic economist tells you that all of your ingenious arguments are familiar fallacies covered in an undergraduate textbook, and that your basic thesis involves a contradiction because you do not understand national accounts. You might decide that you really should go back and read a basic textbook; more likely, you begin denigrating economists as pompous types who actually don’t know anything. And finally, the bad-mouthing of economists, by people who typically have rapport with their audience because they share that audience’s misconceptions, reinforces the perception that economists have nothing to offer – which encourages more non-economists to declare themselves experts, enter the fray, and reinforces the cycle. In short, there is a circular process by which bad ideas drive out good. As far as the public discourse on international trade is concerned, this process is essentially complete: not only sophisticated theories, but comparative advantage and even S – I = X – M have been driven out of the discussion. Tuesday's announcement of the 2005Q4 GDP numbers provides the background for this week's entries. Unfortunately, the investment response to this inflow has been uninspiring, to say the least. Corporate capital spending has grown less than 20 per cent since 2000, declining as a share of GDP. If high profits weren't leading to higher levels of fixed business investment, that would definitely be a cause for concern - although not necessarily a reason for increasing corporate tax rates. But is it in fact the case? The reference to 'corporate capital spending' bothers me: I've never heard of a data series with that name, and a search of CANSIM (Statistics Canada's main source of economic data) leaves me no wiser as to what he meant.